The impact of senior leaders at a global level is valued in the billions of dollars. Therefore, it’s critical that leaders inspire their teams to future-proof their organizations in disruptive industries. How do I support my organization with change efforts? Do I inspire and engage my teams? Do I deliver transformation through culture and accountability? What stops me and my teams from achieving excellence? Given the rapid rate of disruption and emerging competitors, transformational leadership is essential to survival. Change is needed and it starts with leaders. 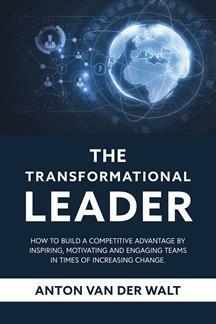 This book proposes a clear step-by-step process for how leaders can transform themselves and their businesses. Transformation is not simply taking a different approach; it means developing a new vision of leadership. Know yourself. This is self-awareness: who you are, what motivates you and what derails you. Lead yourself. This is about self-management: taking care of yourself, self-control and mindfulness. Lead the team. This is understanding team metrics, team effectiveness, deliverables and how the leader and individuals’ function in the team. Lead the business. This is business and people metrics: strategy, culture and engagement. Lead the industry. This is about courage, legacy and, most importantly, influence. Following the transformational leadership model, leaders will inspire their teams to innovate and create change to shape the success of the company. They will learn to challenge employees to go beyond the ordinary and create an aspirational future, one that may once have seemed impossible. As Leaders, we need to stop sitting on the “technology fence”. We need to get connected, involved and invested. If not, technology could become an existential threat – at a scale we do not even understand today. Leaders need to take the first step, and truly transformative leaders will be able to unlock the potential of their people. It is going to be the people in our organizations that will create a new technology future and leaders needs to unlock those talents and capabilities. Great leaders identify talent, turning it into a powerful and creative force. It is this creative force that will future proof our businesses our Industries our community and our world. Anton van der Walt is the author of Leadership Through My Lens, a book combining two of his passions: photography and leadership. He has spent 20 years working in corporate positions across the globe, including China, the Middle East, South Africa, Europe, Australia and Thailand. “How people work with people” is the driving force behind a lot of Anton’s thinking and teaching. He is passionate about inspiring people and guiding business leaders to best develop themselves, their teams and the business. He combines his years of personal experience, along with those of the many highly successful people he has worked with, to create tools and innovative techniques that inspire and motivate. Anton firmly believes that great leaders are truly passionate about what they do. This passion brings out the best in those they lead.